I will attempt day by day to break my will into pieces. I want to do God's Holy Will, not my own! Born in Assisi, Italy, March 1, 1838; died on Isola di Gran Sasso, Abruzzi, Italy, on February 27, 1862; canonized in 1920. Francis Possenti, the 11th of thirteen children of the lawyer Sante Possenti, was raised in a wealthy family that was both pious and cultured. His mother died when he was only four years old, and his father had just been appointed the registrar of Spoleto. He was so inordinately vain and innocently, but passionately, devoted to worldly pleasures, that his friends referred to him as il damerino ('the ladies' man'). Before he finished school at the Jesuit college at Spoleto, he fell dangerously ill, and he promised that if he recovered, he would enter religious life. Upon his recovery, however, he did not act immediately upon his promise. Sure, he joined the Jesuits at age 17 but delayed entering the novitiate. A year or two later, when he fell ill again, he renewed his promise. Once again he recovered. This time he fulfilled his vow and astonished everyone when he announced that he was entering the Passionist Order at Morovalle near Macerata immediately upon his graduation in 1856. His religious life was one of love throughout--joyous love made all the sweeter by the penances prescribed by his rule, which he fulfilled to the letter. There was nothing extraordinary about him except his fidelity to prayer, his love of mortification, and his joyfulness of spirit. He was ordained, but, at the age of 23, just after finishing his studies, he was stricken with tuberculosis and died at age 24. Through his intercession it is believed that Saint Gemma Galgani was cured of spinal tuberculosis (Attwater, Benedictines, Butler, Delaney, Encyclopedia, White). Gabriel is the patron saint of students, particularly those in colleges and seminaries (acting as a model to them), of the clergy, and of young people involved in Catholic Action in Italy (White). The faithful, who devoutly recite Our Father, Hail Mary and Glory be, adding the invocation, "Saint Gabriel, pray for me," before a representation of St. Gabriel of the Sorrowful Mother, may gain an Indulgence of 300 days. Saintly youths are a great joy to the Church. Prominent among those of the nineteenth century is the Blessed Gabriel of the Mother of Sorrows, a member of the Congregation of the Passion (1). Leo XIII used to call him "the St. Aloysius of our days." His family name was Francis Posenti. His father was a well-to-do civil official of renowned Assisi in Umbria. Here Francis was born on March 1, 1838, the eleventh of thirteen children. To facilitate the higher education of his children, the father moved to Spoleto in 1842. Unfortunately, however, the mother died soon after. But the father was a deeply religious man. He spent an hour in prayer every morning and then went to Mass, bringing the children with him. Every night he questioned his children to learn where they had been that day and what they had done, then he said prayers in common, always adding some instruction and admonition. What he most insisted on was the avoidance of bad companions. Francis received his elementary training from the Brothers of St. John Baptist de la Salle, and made his higher studies in the college of the Society of Jesus at Spoleto. From his early years he showed generosity and self-control, he was docile and obedient and had a great liking for spiritual things. But his character had also some dangerous leanings. He was very impulsive and inclined to anger. It was not bad will, however, and whenever his temper carried him away, at once there came repentance and each time he humbly asked his father's forgiveness. Another tendency might have been still more dangerous. He made rapid progress in his studies, was proficient in all branches and won great applause when he appeared in public. Besides, he had agreeable manners and a cheerful temperament, so that he was beloved by all and was known only as "the genial Francis." All this tended to foster his vanity and to end in a desire of pleasing men. Shoes, clothes, cravat, the cut of his hair had all to be of the latest fashion. He eagerly sought after lively and witty society, and delighted in novel-reading, hunting, and theater-going. In the latter he was always accompanied by his father and in all there had been nothing that passed the bounds of innocence. His particular delight was in dancing, and every one knew this. So when he unexpectedly entered the cloister, his professor announced the news to his classmates with the words: "Have you heard what has happened to the young dancer? Who would have thought it: He has left all and has entered the novitiate of the Passionists." In spite of his inclination toward vanities, however, he had avoided bad companions on principle, and if any one dared utter an immodest word in his presence he was sure to get from Francis a sharp reproof. Still there is little doubt that in course of time the siren song of the world would have proved dangerous to him. Then, while hunting, he was dangerously wounded. Within a few days death robbed him of his dearest sister. This seemed to end his wavering and he made known his promise to his father. The latter, however, could not believe that his son was destined for the cloister and tried to drive the thought out of his head by engaging him in visits to the theater and in evening parties, and by expressing his desire that Francis should think of marrying a girl of respectable family. At this moment the Blessed Virgin interposed. On the octave of the Assumption there is carried in solemn procession through the cathedral of Spoleto an ancient and much venerated picture of Mary. When it passed Francis it seemed to him that the Blessed Mother looked sharply at him while an interior voice spoke distinctly: "You know that you are not made for the world. Why, then, do you still remain in it? Enter soon into some Religious Order." He was conquered and hid in a corner of the church to conceal his excitement and his tears. His confessor, Charles Bompiani, S J., to whom he revealed his secret, approved the genuineness of his vocation and his intention of joining the Passionists. But Francis said nothing of his interior change to his friends. At length, on September 10, 1856, he arrived at the novitiate of Morovalle, near Macerata. What had happened to St. Aloysius now happened to him. As soon as he crossed the threshold of the cloister he was overwhelmed with a flood of joy, convinced that he was now in the place where his soul would find rest. On the feast of the Mother of Sorrows, the third Sunday in September, he was given the habit of the Order and the name, Gabriel of the Mother of Sorrows. He now wrote to his friends, taking leave of them and begging pardon for not having given them a better example. His separation from the world was now complete. He would work at his own perfection and the things of the world could no longer have interest for him. In return for this complete surrender God granted him such fulness of consolation and enlightenment that the empty joys of this world became a disgust to him. This great contempt he had conceived for the world excited the wonder of all. To his father, who had expressed some fear for his perseverance, he wrote: "It is impossible to desert so lovable a lord as Jesus Christ and so loving a lady as Mary." It would be a mistake to think, however, that our cheerful young man had suddenly become pessimistic and melancholy. The serenity of his soul had in reality become far more pure and undisturbed. He had found all that his noble mind could long for. The charm of his genial, friendly character had a kindly influence on his brethren and on all who met him. Strangers who had made their retreat in the monastery, frequently would not leave without a talk with the friendly Gabriel. Young people asked for entrance into the religious state on the ground that they had seen a young religious from whose countenance there shone a heavenly gladness. Whenever Gabriel met with boys, he conversed in a friendly way with them and skilfully mingled with his talk some pious exhortation. After a year of noviceship he made his religious vows with a joyous heart. The young religious made his philosophical and theological studies in Pievetorina and in Isola, near Penne. His religious fervor never relaxed but continually increased. He was not without trials, however. God permitted him to suffer violent temptations against faith and confidence and he experienced a great dryness in prayer. But his firmness remained unshaken during such assaults, his virtue struck only deeper root and soon heavenly consolations came again in manifold ways. "Meditation," says his director, "always so kindled his fervor, that he would have done many things injurious to his health if he had not been so obedient and I had not carefully watched over him. I had no reason to urge him to virtue; on the contrary, I had often to moderate him. During the last days of his life I was obliged to forbid him the usual meditation because he would become so absorbed in the eternal truths that it was an effective hindrance to his health." Love of the Crucified Saviour, of the Sacred Heart of Jesus, and of the Blessed Virgin were his chief virtues. While Gabriel's years of study were coming to their close, so, too, his earthly pilgrimage was nearing its end. When he was twenty-three years of age he was stricken with consumption. His strength rapidly declined and February 27, 1862, he died a holy death at Isola. His last words were to the Blessed Virgin. Remarkable miracles occurred at his tomb. The deaf, dumb, blind, and lame were cured in so surprising a way that the like is hardly to be found in the records of the saints. The decree of his beatification declares that "the miracles which glorified the beginnings of the Church one could behold renewed at his grave." At the beatification, which took place on May 31, 1908, a brother of the Beatified was present. 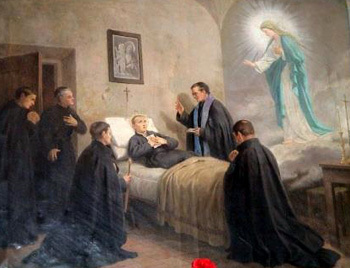 Since then the miracles at the grave of Blessed Gabriel have not ceased and application for his canonization has already been made. May he be a mighty protector of our youth, whose faith and morals are exposed to gravest dangers! "Let the meditations generally be about the divine attributes and perfections, and also about the mysteries of the life, passion and death of our Lord Jesus Christ, from which all religious perfection and sanctity takes its rule and increase." Such is the commencement of the chapter on mental prayer in our rule. God himself could find no more excellent way to manifest His attributes and perfections, and above all His love for man, than by the passion and death of Jesus Christ; and man can find no more powerful motive than this to avoid sin, to practice virtue and to love his God. "The Passion was the ordinary subject of Gabriel's meditations," writes his director; "but he did not rest satisfied with a few superficial considerations and affections; he entered into it in such a manner as to be penetrated with the reasons for which Jesus suffered and died, investing himself with His sentiments and motives, especially His infinite love; and to render these meditations practically useful, he considered in particular those virtues of which our suffering Lord gives us such bright examples, bringing home to himself their circumstances and divine perfection. In the light of these considerations, Gabriel humbled himself for his faults and shortcomings, conceived a high esteem and love of virtue, encouraged himself to practice it, forming at the same time the strongest resolutions. These he carried away in his heart, kept them continually before his mind, and tried to incorporate into his daily life." "From the commencement of his religious life, when he began to meditate seriously on this subject, the servant of God applied all the powers of his soul to it, so that, as F. Bernard deposes, it seemed as if his mind could fix itself on nothing else, and as if the love and gratitude of his heart could be centred on nothing else. It was enough merely to allude to Christ's sufferings to make his fervent spirit burst into sudden flame, like flax when touched with fire. He would at once begin to speak with wonderful fluency and enthusiasm, and this he would keep up for a considerable time. At such times our companions, who before had been conversing among themselves, would as by a common impulse turn to Gabriel, and captivated by his extraordinary and touching words, listen eagerly to him as he spoke of our duty of mourning over the sacred passion of Jesus, in union with His Blessed Mother." Often, too, did he call their attention to their distinctive obligation as Passionists "to promote according to their ability, devotion to the sufferings and death of our Blessed Redeemer in the hearts of the faithful." A few times only, he was chosen to deliver a little discourse in the church attached to our retreat, and then he plainly showed to all, his zeal and fervor to the great spiritual edification and profit of his hearers: but it was not often given him to promote this grand work in public, daily however he earnestly besought our Lord to assist all those that advanced this salutary devotion. Even in His glory, our Blessed Saviour exhibits the wounds He received in His crucifixion as so many trophies of His love, for the contemplation of saints and angels; and such is His desire that on earth too, all men should piously remember them, that He left us the Sacrifice of His Body and Blood as a perpetual commemoration of His death. When assisting at Mass our Gabriel found his delight in devout meditations on the Passion, together with fervent prayers. In his visits to the Blessed Sacrament, and in Holy Communion one thought was predominant in his mind: "He who is here, suffered and died for me!" During the hours spent daily in meditation in the shadow of the tabernacle, one thought was ever welling up from his heart: "He who suffered and died for me is here!" The Sacrament of the Altar was then for him truly what Christ desired it to be, the living commemoration of the Passion. There was yet another means to the same end, dear to the heart of Gabriel; one which the Church of God has ever conspicuously placed both in life and in death before the eyes of her children: the crucifix. "They shall look upon Me whom they have pierced, and they shall mourn ;" (Zach. xii. 11) " and I, if I be lifted up from the earth, will draw all things to Myself." (John xii. 32.) "Whilst they are in their cells," say our regulations, "let the religious keep the crucifix before their eyes, and often take refuge in its sacred wounds and accustom their hearts to send forth frequent darts of love toward their sovereign Good." Gabriel fully entered into the spirit of this regulation; for he kept his crucifix on his table by the side of his book, or even held it in his hand: and so frequently did he press it to his lips, that he actually wore it away. It was principally at the foot of his crucifix that he spent those few minutes of meditation before spoken of; his first thought in the morning was Jesus Crucified; with His image closely pressed to his heart he fell asleep at night; while reciting the divine office in choir he had continually before his eyes a devout little picture of the crucifixion, joined to which was a still smaller one of the Virgin of Dolors. Let us adore and give thanks to God the Father everlasting, Who, of the great love He bore us, was pleased to send His only-begotten Son into the world to suffer and die on the gibbet of the Cross; and let us beseech Him, for the sake of His passion and death and by the intercession of Saint Gabriel, that most loving follower of our crucified Lord, to grant us the favor for which We pray [here mention your request]. Let us adore and give thanks to God the eternal Son, Who, becoming man and dying for us upon the Cross, left us Mary most holy to be our Mother; and let us beseech Him, by the merits of this sorrowful Virgin Mother and by the intercession of Saint Gabriel, who was her most devoted servant, to grant us the favor for which we pray [here mention your request]. 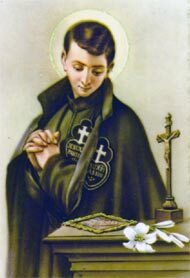 Let us adore and give thanks to God the eternal Spirit, Who of His infinite goodness communicates Himself to our souls to make them holy; and let us beseech Him, by the merit of the same divine goodness and by the intercession of Saint Gabriel, who in a special manner shared therein and corresponded thereto, to grant us the favor for which we pray [here mention your request]. Shortly after entering the Passionists Saint Gabriel composed this prayer. He was to die but six years later (in 1862), at the age of twenty-four. Behold me at Thy feet, O Lord, begging for pity and for mercy. What wilt Thou lose in granting me a great love for Thee, deep humility, great purity of heart and mind and body, fraternal charity, intense sorrow for having offended Thee, and the grace to offend Thee no more? What wilt Thou lose, O my God, by enabling me to receive worthily Thy Son in Holy Communion, by assisting me to act through love of Thee in all my thoughts, works, penances, and prayers, by granting me the grace of loving Thy Holy Mother most tenderfully and trustfully, the grace of persevering and of dying a good and holy death? I am Thy beggar, covered with sores and rags, asking for alms; oh, look upon my misery! Behold my proud head, my cold and stony heart; behold my mind filled with worldly thoughts, my will inclined only to evil, my body rebellious to every good work. Help me, O my God; help me to conquer myself! This I ask through Thine infinite mercy. To obtain it, I offer Thee the merits of Jesus Christ, our Savior and Lord. I have no merits of my own; I am destitute, but His wounds will be my plea. Had I shed my blood for love of Thee, like Thy Son, wouldst Thou not grant me this favor? How much more oughtest Thou to hear me now, since He shed His blood for me? Thou hast promised in Thy Gospel that whatsoever I request that is good for my soul, Thou wilt grant: "Ask, and you shall receive." Now, as Thou canst not withdraw Thy word, I beseech Thee through Thy infinite goodness, through the heart of Thy Son wounded with love for me, through the infinite charity of Thy Eternal Spirit, through the love Thou bearest to Thy most holy daughter, Mary, and for the honor of the whole heavenly court, into which I ask Thee one day to admit me. Amen. "Jesus, Mary, Joseph, I offer you my heart and soul. Jesus, Mary, Joseph, assist me in my last agony. Jesus, Mary, Joseph, may I breathe forth my soul with you in peace." Hail, full of grace, Mother of mercy, holy Mary. Through you the fountain of all grace flows for the Church, holy Mary. Graced by the angels' praises, accept the praise of us sinners, holy Mary. The hope of the forsaken, the deceased, the joy of saints, holy Mary. Gabriel rejoiced in you, the Holy Spirit overshadowed you, holy Mary. The Most-High Father exalted you while creating you as mother of his Son, holy Mary. O glory! O joy! That you would bear the Son of the Most-High, holy Mary. O mistress! Intercede for us with the Lord, your first-born, holy Mary. A sword pierced your soul while the lance pierced the side of the crucified one, holy Mary. Chains, buffeting, the crown of thorns, the whipping; all bore upon your own heart, holy Mary. O joy! The Lord is risen! Behold, O Virgin; your Son lives! O holy Mary. O Queen! He reigns, he conquered, he rules! No more to die, your only Son, holy Mary. And now, exalted by the angelic choirs, you reign with your Son in the midst of heaven's glory, holy Mary. Remember us, in your mercy, we poor ones, who are exiled; lead us to the heavenly sanctuary, holy Mary. O Virgin! O Mistress! O Mother regal; O holy Mary. Dear Saint, your very name recalls your particular devotion to Christ the Man of Sorrows and to Mary the Afflicted Mother. You died young as a Passionist religious but left to us all an example of a life of Christlike sacrifice. Intercede for our seminarians and young religious who are in desperate need of your patronage amid today's sensual and selfish world. Amen. O God, You taught Saint Gabriel to dwell upon the sorrows of Your most sweet Mother, and You raised him to the glory of holiness and miracles. Grant that we may also share Our Lady's sorrows, and be saved by her protection and intercession. Amen. O good St. Gabriel, God inspired you to love the passion of Jesus as it was reflected in the heart of Mary, his mother. By her side, you stood beneath the cross of Jesus, gazing on him as she did, and sharing her compassion. O St. Gabriel, we wish, like you, to grow in love for God and all his people. Remember us in the trials of our life. Remember especially those who are young and in need. Support us, all our days, by your holy prayers. And when this life is done, may we join you in heaven in the joyful company of Jesus and Mary.